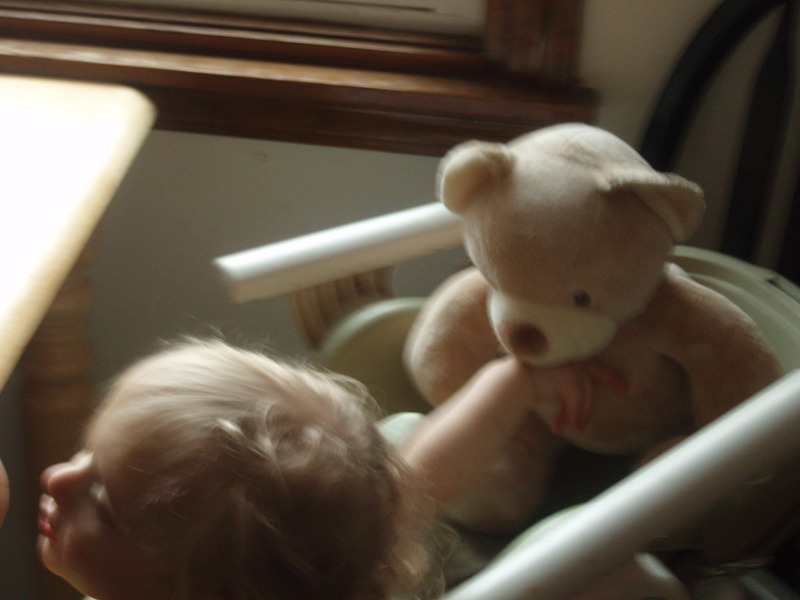 Yesterday, as I was bustling around in the kitchen, the twins were wandering in and out as usual. This is what I witnessed. It wasn’t until the about halfway through the process that I finally realized what they were doing and took pictures. 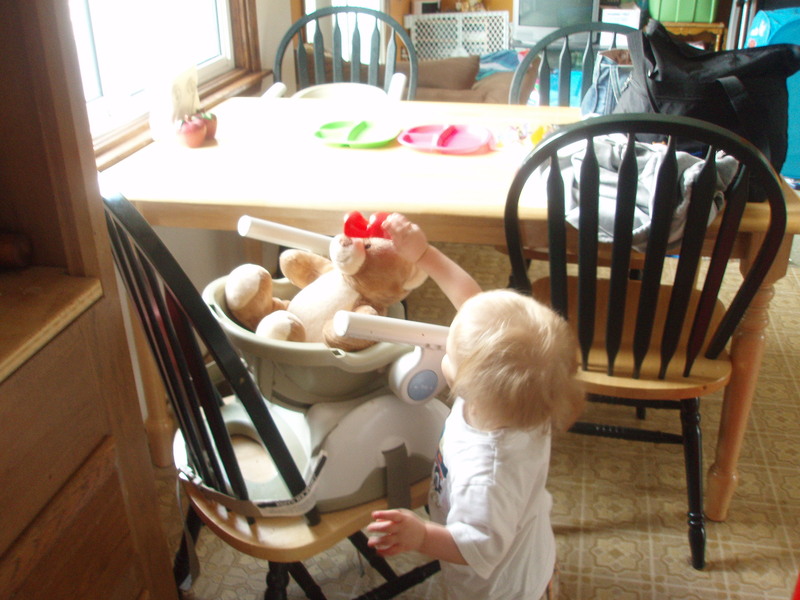 Will turned his highchair away from the table. He went into the living room. 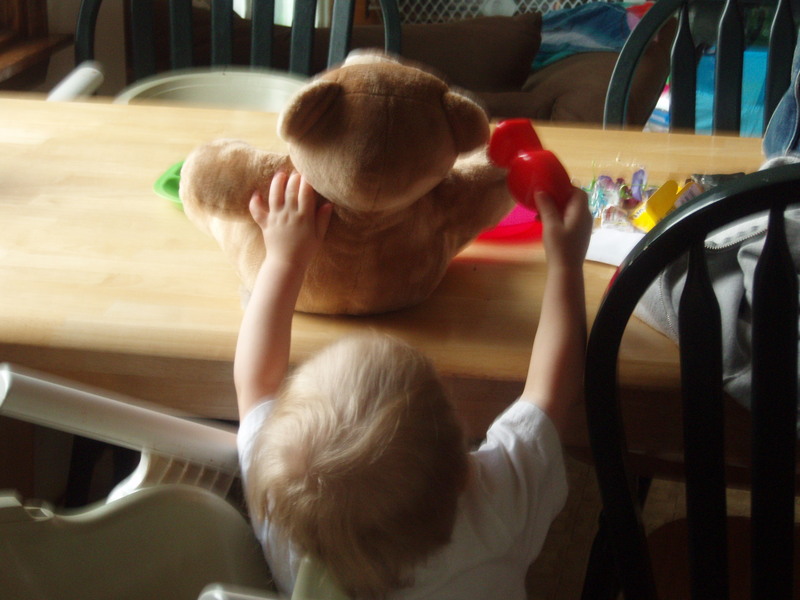 He came back with a stuffed bear and set it on the floor. 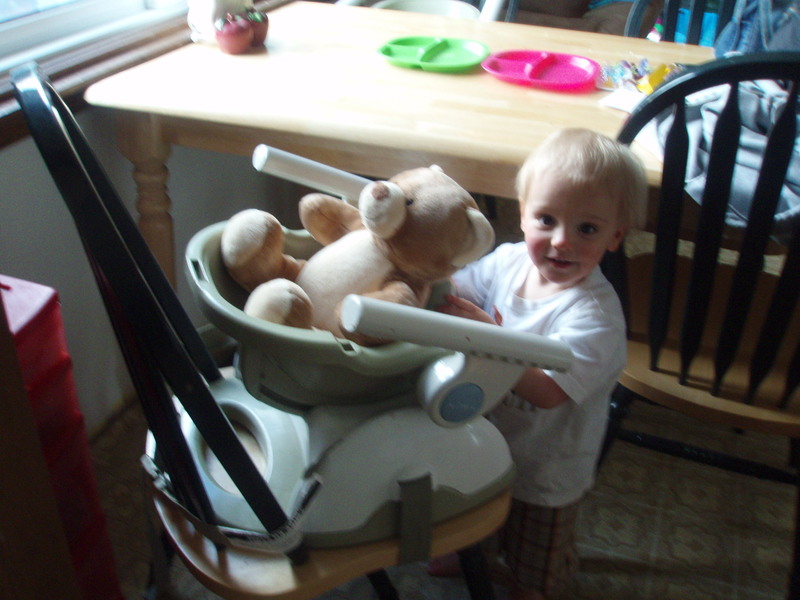 He fiddled with the buckles on the high chair for a minute and set the bear into the high chair. He went back into the living room. 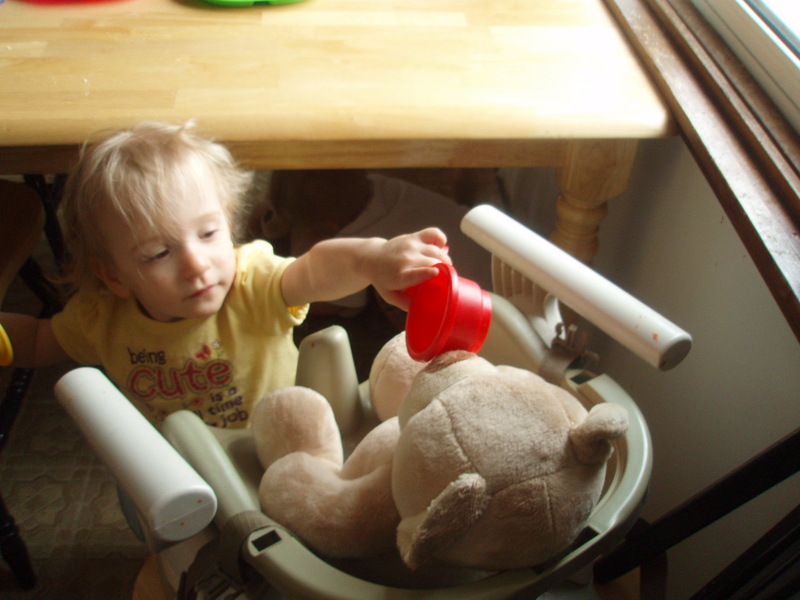 Ariel then turned her highchair away from the table. She went into the living room. 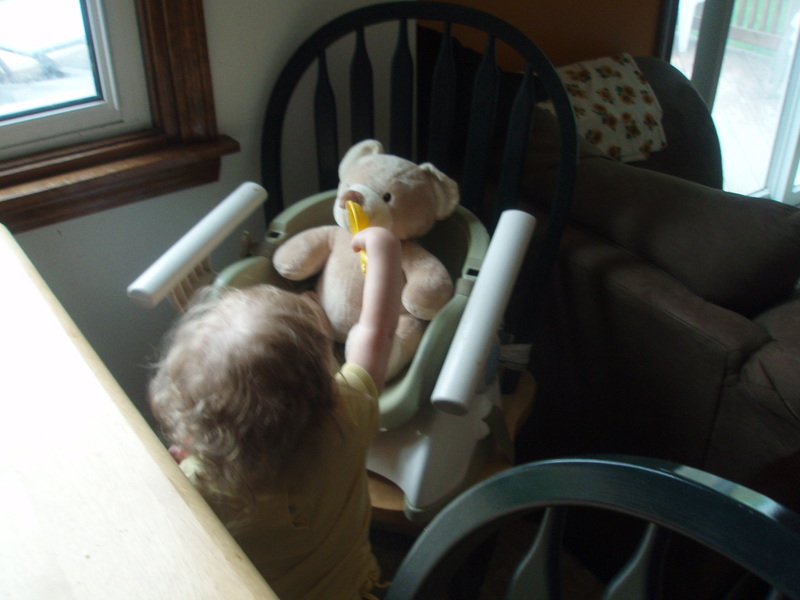 She came back with a stuffed bear to match and put it in her highchair. Monkey see, monkey do. They both disappeared again. For a while. A loooong while. I figured they were bored with the bears. Nope. The bears were noisy, slurpy eaters though. I wouldn’t want them as dinner guests every day. Next, Burritos. That’s what we had for dinner last night. Tim cooked up Skirt Steak after it marinated overnight in a pineapple BBQ sauce. He put that, as well as the onion, pepper, cheese and corn bruschetta mix from the other night into Sun-Dried Tomato burrito shells. Yum! He used cheese, chopped red peppers, and the burrito shells to make quesadillas for the kids. 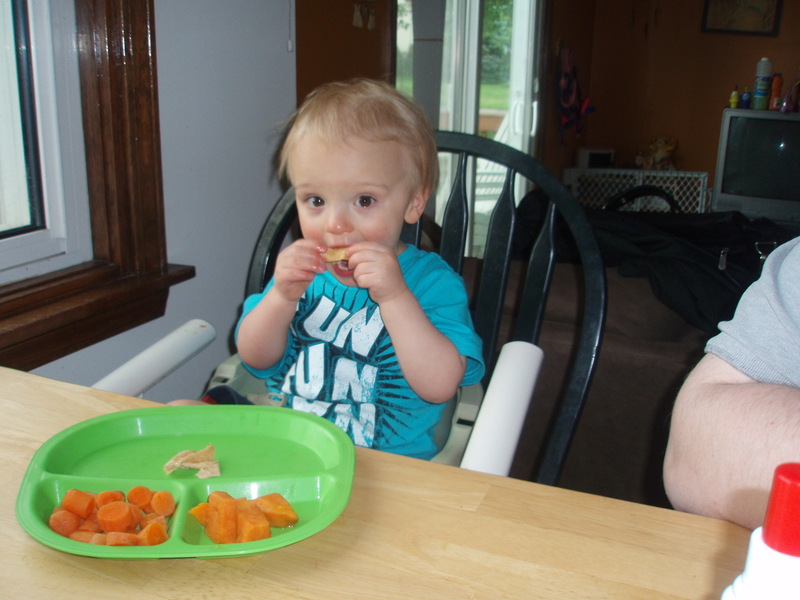 Now, Will does not really like cheese or red peppers. 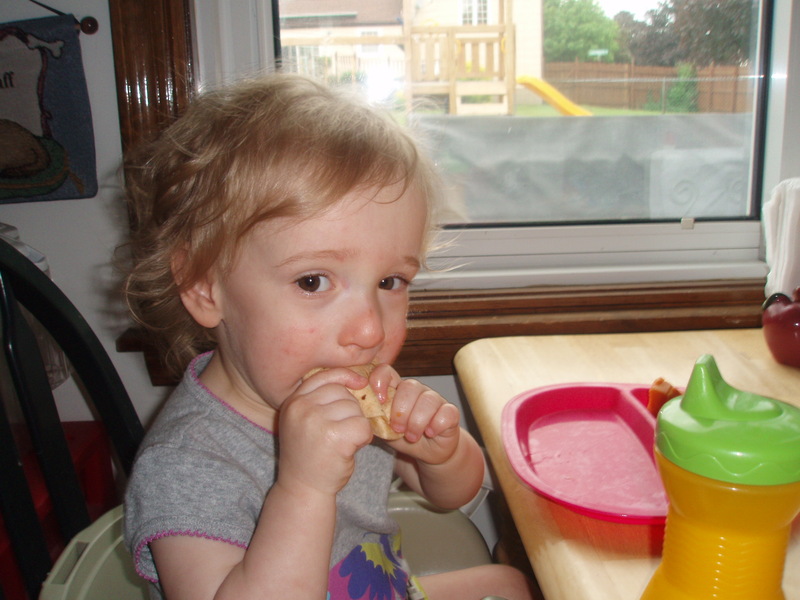 And, they sometimes (because as toddlers they change their minds about what they like VERY often) refuse to eat quesadillas. 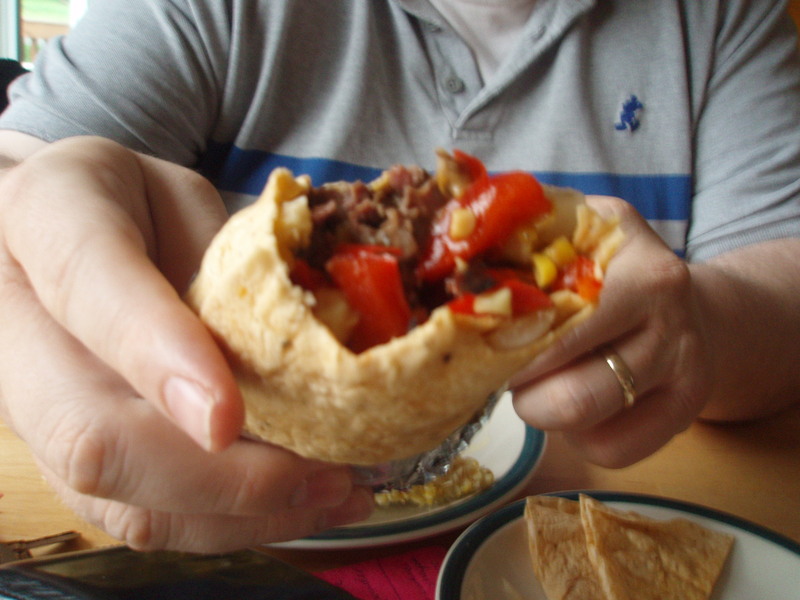 However, if we call them burritos (which they find fun to say), and keep them in front of us as if we’re eating them….. Cheese (sorry, don’t know what kind! 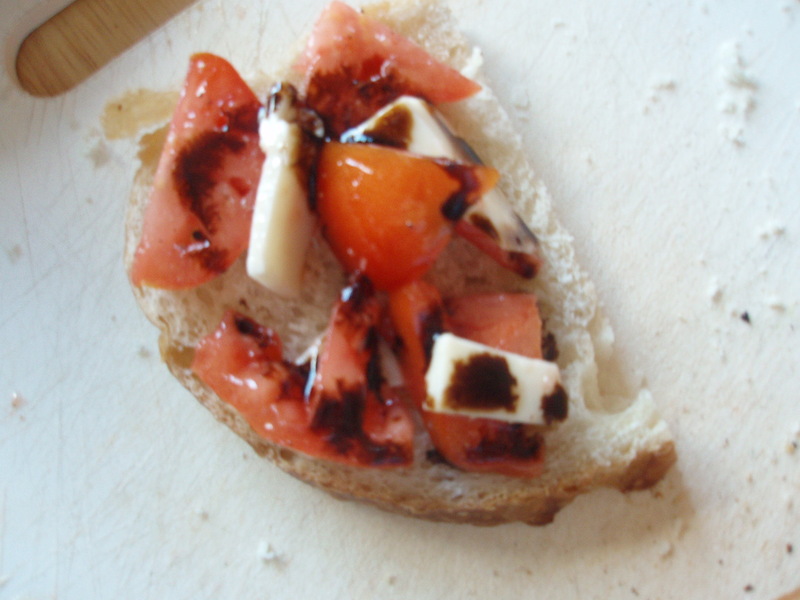 ), Heirloom tomatoes, and balsamic glaze drizzled on top. OH MY! This is now. THEN: My First Insemination. I want to try to be accurate, but not too graphic, just an FYI. After taking Femara at the appropriate time of the month, approximately when I should be ovulating, I went in for sonograms every 2-3 days to see if/how the follicles were growing. When they were the appropriate size, I was scheduled for the insemination. On that morning (morning is the only time they are scheduled because that is the best timing), Tim took his little sample cup that we had been given previously. 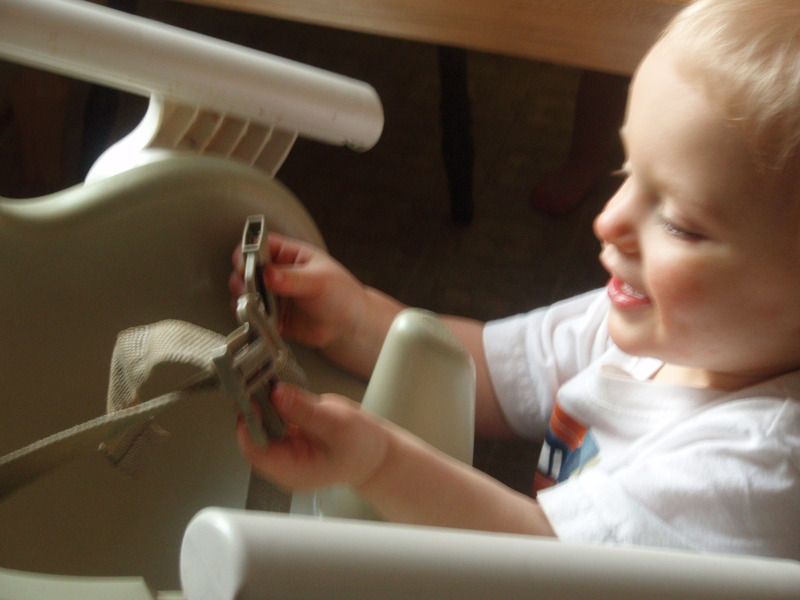 He had been given the choice to obtain his sample at home that morning, or to get to the clinic early and do it there. He chose home. We had to time it correctly though, because it had to be kept warm…..so as soon as he was done I took the sample and tucked it under my shirt and we left. He drove, that’s why I had to hold the sample. When we got to the clinic, we turned in the sample and waited. They took the sample and spun it, and counted it, and tested the viability. When they were almost done (about 20 minutes), they called us back into the exam room and I got undressed from the waist down with a sheet draped over my legs. After a few more minutes, they came in with the sample in a large syringe, all labeled with our name and date and time. They showed us the paper detailing the count and the viability. Everything looked good! (Tim was glad). Next, I had to lay back on the table with my feet in stirrups. I got another sonogram to check the follicles again. They inserted a smaller tube and it was a little more uncomfortable than the dye test. Tim stood by my head and held my hand and when I would grimace, he would whisper to remind me why we were there. It didn’t take too long to get the tube in, but they did have to wiggle it a little to get it far enough in, which was not really fun at all. Not at all. I think I’m crooked down there. Anyway, then they attached the syringe with the sample to the tube that was now inside me. They pushed the syringe, and the sample was in! They waited a few moments before removing the tube, they elevated my hips, and told me to lay like that for 10-15 minutes. After that, I got re-dressed, and Tim and I went to breakfast at Panera (which then became a tradition every month). We had both taken the whole day off of work just so we could relax and let my body (hopefully) do its thing! That was then. Question: What was your favorite dinner item so far this week? Thanks for stopping by my blog. So nice to (digitally) meet you! Nice to meet you too! I’m so excited, you’re my first comment! Thanks!